Location can't be beat. Condo was great inside and out. Nicely decorated. Not the tourist beachy look like a lot of places. Decorated in a way I would of had my own condo if I had one on a beach. Came with everything you would need like pots, pans, dishes, washer / dryer and so on. Not dated at all. Covered and gated parking was nice. Cant say enough with how happy we where with the place. Management company where pleasant to deal with getting in and out of the place. Would stay here again if we are in this area in the future. Views, Views, Views! Oceanfront panoramic views of Lover’s Point and the Monterey Bay. Both the living area and the master bedroom of this single floor condo have breathtaking views! Watch whales and other marine life and passing boats with the spotting scope or watch kids play on the beach. The well-equipped kitchen of this unit features maple cabinetry, granite countertops, and stainless GE Profile appliances. Large flat screen televisions with premium cable service are provided in all rooms with a DVD player in the living room, high speed wifi internet access and land line telephone service. The bedrooms are furnished with premium Cal king or queen sized beds flanked by reading lamps and recessed lighting as well as flat screen TVs. The bathroom is equipped with a granite vanity with dual sinks and a shower over tub. The unit has central forced air heating and includes a Spacemaker washer and gas dryer. Carport parking with your own designated space behind a security gate is also provided. Swim, dive or kayak at Lover's Point cove across the street (with a white sand beach for sunning, a kiddie pool, beach volleyball court, snack bar/cafe/restaurant, grassy areas for picnics and bike, surrey, kayak and paddle board rentals, this park is a favorite of visitors and locals alike). Play golf at the oceanside Pacific Grove Golf Course, affectionately known as a "budget-minded alternative" to Pebble Beach. Or stroll down the coastal recreation trail just outside your front door and commune with seals and sea otters. The shops and restaurants of downtown Pacific Grove are just a short walk away. For an even more varied dining experience, a longer walk or a short drive will take you to Cannery Row, Fisherman’s Wharf, downtown Monterey or Carmel. And once you're completely relaxed, Pacific Grove is convenient to an amazing range of activities on the Peninsula. Within minutes you can be touring scenic 17-Mile Drive, hiking to secluded Big Sur beaches, horseback riding, deep-sea fishing or whale watching. This third level unit is one of only three at the property with decks overlooking Lover’s Point and Monterey Bay from both the living area and the master bedroom. This unit has it all! A "magic carpet" of wildflowers in springtime. Interior sidewalk to access units and stairs. Lover's Point is across the street. Stayed for work . The apartment had everything I needed. Lovely to watch the ocean in the evening and relax . Would stay here again !! We absolutely loved the location and the condo was perfect! I have been renting from Monterey Bay Property Management for almost 10 years now. Ocean Harbor and La Playa Townhomes were my favorites, but, Lover's Point 7 has moved to the front of the pack. I hesitate to say this because I want it available for my next stay! The unit is spotless. The sofas and beds are comfortable. The unit is quiet because it is on the top floor, and it is the corner unit allowing for another huge window facing west. The ginormous flat screen in the living room and flat screens in each bedroom are amenities I've not seen in any other unit. The living room and master bedroom both have patio doors that open to balconies. Lover's Point directly across the street, provides people watching entertainment all day long. It's the ocean in all its magic that draws us to the bay to begin with, and the view from this unit is second to none. The only complaint is the 3 flights of stairs! But, I've since found out that if we call in advance the maintenance man might be available to assist with lugging our things up. The only thing missing was a colander which was a problem when the only meal we brought was spaghetti. There was plenty of products - toilet paper, paper towels, laundry and dish soap. I learned to bring my own based on past experience, but, this unit had plenty. FIVE STARS all the way!!! We enjoyed 5 beautiful days at Lover's Point 7! Couldn't have asked for a better central location to Pebble Beach/Carmel and Monterey. The added view of Lover's Point was terrific. Although we had wet weather, the views and all of the local activities kept our stay on point. So nice to get up in the morning and enjoy a leisurely breakfast (in a well appointment kitchen) with a view. Had a couple of nice happy hours too! Would recommend this location for those who want to relax or stay busy. Either way, your stay at Lover's Point 7 will be comfortable. Everything was very satisfactory with exception of carpet in need of thorough cleaning. This situation is the same as Feb. of 2018 when we spent two weeks in Lover’s Point seven. Previously discussed via email with Kyle. Carpet is still badly soiled. A fluorescent tube in Kitchen needs replacement. We hope to return next year and trust these issues will be corrected. We had an absolutely wonderful time. There was a storm coming in and we watched the waves for hours. Picked up some crab at Phil's Market, marinated it, and ate out on the balcony. The beds were comfortable and the sheets were awesome. We could have used a little more toilet paper and paper towels, but other than that we would definitely stay again! Lover’s Point 7 is a stunning 2 bedroom apartment with an amazing view of the bay from the living room and bedroom. The place was very clean, comfortable and in a safe & trendy location. The property was equipped with high quality furniture and tastefully decorated. TV in each of the bedroom and in the living room. The kitchen was very well equipped.... even had some of the basics, which was awesome and saved me from buying them (salt, cooking oil, olive oil, coconut oil, spices, sugar etc). Walking distance from the Monterey Aquarium, which was a great walk along the beach, we spotted 7 dolphins, many seals and even 2 deers, all in that short walk!Thanks for a very comfortable stay. Highly recommend this place!! Our family of 4 spent 3 nights at Lovers Point condo #7. The views are awesome and the condo was well equipped. The location of the condo makes it convenient to visit the aquarium, Canary Row, Carmel, Big Sur and 17 mile drive. Check in/out was very easy. 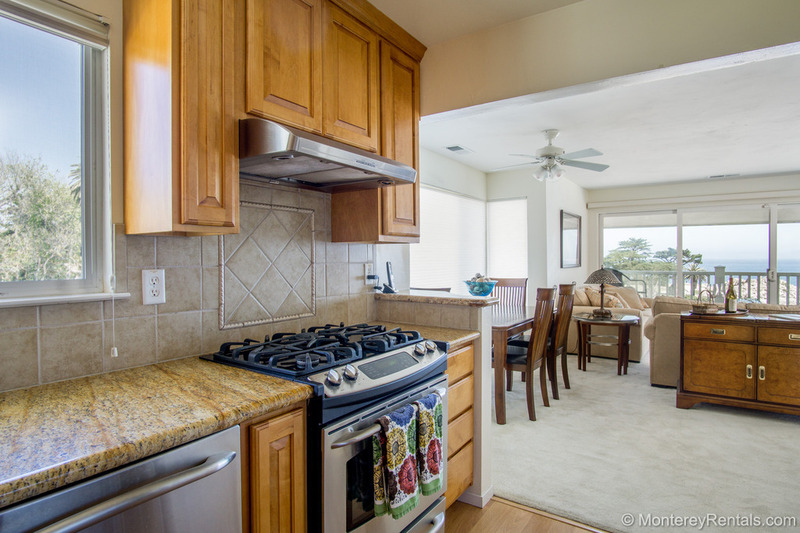 I would highly recommend this condo to anyone visiting the Monterey Bay Area. Our family had a great time here. It is such a beautiful spot overlooking the ocean. The property was very nice and super clean. The property is also within walking distance of Cannery Row, which was great! Every evening we walked there to find a new restaurant and shop. Very nice area. The only issue we had at the property was low water pressure in the shower, but that’s quite minor. Also, very glad we didn’t rent a big SUV because the parking area is super tight. We rented a mid-size SUV (Dodge Durango) and it fit fine, but had to be very careful pulling in. Lover's Point 7 is a beautiful place to stay! We loved Lover's Point 7! The condo was beautiful and had a fantastic view of the park and the ocean. It was very clean and had everything that was listed as complimentary supplies - such as coffee, sugar, dishes, silverware, pans, coffee maker, etc. Everything was in perfect working order. This condo was within convenient walking distance of the ocean, walkways, bikepaths, restaurants, even the aquarium. I could go on with the compliments, everything was wonderful. My only suggestion is that someone should update the emergency box. We found one easily when my niece cut her finger badly (just as we were arriving on the first day), but it had old yellowed bandaids and outdated first aid ointment. Some fresh supplies would have been helpful at that moment. That being said, we admitted to ourselves that we should have thought to bring a first aid kit along ourselves. Thank you for sharing your beautiful vacation spot with us. Just spent a week in this lovely place and we were very impressed. We walked in to a very clean and beautifully decorated space that had everything we needed to be comfortable. The view of Lovers Point was perfect and so close to everything we could want to do in the area. We were given all the information we needed and are very happy with the service we received. We hated to leave and look forward to coming back again. We truly enjoyed our 2 weeks stay, Feb. 11 - 25, '18.This unit is roomy & comfortable with nice furnishings.Kitchen is well equipped for cooking with good selection of dishes, silverware, etc.Views of Monterey Bay and the coastline from this 3rd floor unit.are great & just across the street.Town is a 10 minute walk to restaurants, shops, movie theater and all we needed. Even the weather cooperated with sunshine each day!We plan to return! We had a wonderful time in this beautiful, comfortable condo. The three of us slept well in the cozy beds. The view is amazing as we spent each morning and early evening on the porch. The condo was very clean and had everything we needed. We appreciated the wonderful people who helped with our rental since everything went so smoothly. We plan to be back someday soon. Thank you! It was our first time staying at Lover's Point 7. The views were incredible and the unit was clean and well appointed. My husband and I had a wonderful time and cannot wait to come back next year. Pros: The condo we stayed at was amazing. It was the perfect top corner unit. The furniture was very new and the decor was everything a vacation should be. We never cooked once. Had no desire to dirty the unit since this was a vacation:) We enjoyed the local eateries. We had a wonderful dinner at Beach House at Lovers Point. The clam chowder was pure silk and the beef stroganoff was delicious. I would definitely return. Not really a con: If you can add a side table or folding luggage rack would be great in each bedroom. The condo was perfect for the 3 of us. We brought our toddler and it was nice to be able to watch the beach during nap time! The condo had everything we needed for the week.